“Fury” is the latest war movie that hit the box office this fall. With an ensemble cast featuring Brad Pitt, Shia Labeouf, Logan Lerman and more, it was hard for David Ayer to fail in delivering an action-packed portrayal of the closing days of World War II. The film outlined what the gruesome brutalities witnessed in war can do to a young man’s psyche. There are many positives notes to take from “Fury.” For instance, it did not hold back on demonstrating the mingling of American soldiers with European natives. Furthermore, the film showcases the tensions that may arise between veterans and rookies on the job, paralleling the reality of common workplace issues on the home front, away from the battlefields. Yet despite mass respect earned by the efforts of the special effects department, I still sought more out of the script. Ayer has honed his craft in the past, to the point where he now seemed unable to elaborate upon his newest choice of film, a war-themed epic, and bring it into unique territory. It would be a large knock to say that this film was a complete disappointment. 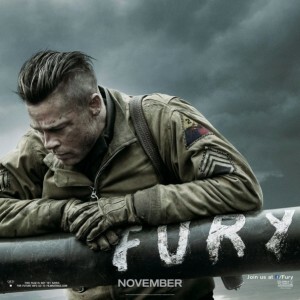 “Fury” met my expectations, but did not go above and beyond them. This is a crutch many filmmakers will inevitably receive when delving into the area of fictitious plots set in actual historical timelines.